Find Queen Ayrenn's missing entourage. Glister Vale — Rescue the Queen's entourage from the mad mage. I found a lost member of the Queen's entourage near the entrance to a hidden Vale. She told me that her fellow entourage members have been taken. a mad mage apparently holds them in the Vale. Talk to Eminelya near the entrance to the Vale. Find out what happened to the entourage. Rescue Minantille, Merion, and Nuulehtel. Defeat the madman holding them captive. Making your way north from Tanzelwil to Skywatch, you might encounter Eminelya of the Queen's entourage resting near a campfire to the side of the road. Speak with her to learn that her colleagues have been abducted by a mad mage. The good news is that the Queen is safe, thanks to the fact that the she travels faster than her entourage due to behavioral issues with the other members. Eminelya will beg you to save the others and will hand you five Teleport Scrolls. Agree to help and your quest will begin, with your initial objective pointing you to where they're thought to be held: Glister Vale. The easiest route to the vale is via a small cave that runs through the mountainous terrain, with entrances marked on your map during the quest. The cave has several Giant Bats blocking your way, but exits into the Glister Vale. Make your way through the gravestones and wolves to the lone tower overlooking the Vale. Once inside, you'll find the first entourage member, Lanitaale, obsessively poring over various trinkets and books. Speak with her and tread through her attempts to buy your clothes. After cleverly convincing her to read the Teleportation Scroll, she'll disappear to safety, and a projection will appear further into the tower. Speak to the projection to learn that this is Sanessalmo, the culprit behind the missing entourage members. He'll non-nonchalantly admit to the fact that he's been using them as experiments for a type of magic that targets emotions, by trapping them in separate worlds created solely to exploit their greatest emotional weaknesses. He'll also comment on the fact that even though Lanitaale has escaped confinement, she won't be able to escape her greed, possibly hinting that she'll suffer from after-effects of his experiments. You'll eventually appeal to him by requesting that Sanessalmo place you into the experiments, allowing you to attempt to rescue them from their vices. He giddily agrees, claiming that regardless of your success or failure, an external influence will make the experiments more interesting. He will then proceed to open the portal to Minantille's Rage. You'll come out of the portal in a tunnel with a single, lit torch of blue fire to the right. Move forward through the tunnel to reach the main area of the experiment. The majority of Minantille's Rage is populated with a large number of Flame Atronachs, most of which are in pairs and are packed tightly together. Low level players can easily become overwhelmed if they allow themselves to get swarmed. There is also a lava flow spanning most of the area, which won't kill you instantly, but does a sizable amount of damage. "How can one live with nothing but rage?" "Minantille was a great general once - stripped of her command." "Minantille's men suffered in death. She suffers in life." "What is a general without war?" "Do all soldiers dream of death?" Two paths split to the north and south. Go up the north path, which will take you through an area dotted with many dead, burned trees and plenty of Flame Atronachs to extinguish. Make your way up the steep hill, and you'll eventually come to another area flowing with lava, which surrounds a large landmass upon which you can find Minantille. There is no bridge across the lava, so hop over or run through it to reach your objective. As soon as you cross the lava, Minantille will ask you to stay away or she will kill you. The miniboss of this area, Minantille's Rage, will then spawn. Take this opportunity to make the first strike. Minantille's Rage uses an inferno staff, and periodically drops two AoEs that look like rings of flame with a symbol drawn from fire in the center. Even at higher levels, it deals a hefty amount of damage with both its basic fire attack and the AoEs, so dispatch it quickly. Once Minantille's Rage is defeated, speak with Minantille. After handing her a Teleport Scroll, Minantille will then disappear back to her companions. Head back to the tower. As you approach the portal leading out of the area, Sanessalmo's projection will appear. He'll comment, with slight surprise, on how Minantille could escape her anger. His projection will then disappear after briefly leaving a red warning circle, and letting off a damaging blast of fire similar to the death of a Flame Atronach. Continue through the portal. 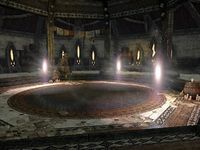 Reappearing back in the large, circular main room of the tower, you'll find that the portal to Minantille's Rage is gone. A portal to Merion's Bliss has appeared. Enter the portal to rescue the third victim of Sanessalmo's Experiments. Merion's Bliss is another subterranean space, this time a cave with many mushrooms populating the walls. It's also darker and more surreal than Minantille's Rage. Move forward and take either of the two paths in front of you, which will lead out to the large, main room of Merion's Bliss. The area is dominated by two massive mushrooms, with several Imps and Giant Bats taking up residence beneath the fungal canopy. The main area has three connected pathways: the east side is where you will come in from, which leads back to the portal. The south and west ends are tunnels, filled with more Imps and Giant Bats, that wind around and up to a second level of Merion's Bliss. The southern, lower path connects to the eastern, upper path. The western, lower path connects to the southern, upper path. For now, head to the north end of the room where you'll find a wooden platform supporting some amenities that include an Alchemy Station. Merion can also be found here, standing across from a Malevolent Spirit. As you approach, you'll hear Sanessalmo's ever-present voice once more: "The picture of true love, those two." Speak with the alchemist to acquire your next objective: finding Merion's Backpack. "It's so easy to make Merion happy. For a time." "He really loves alchemy. Everyone mixes well with him." "If Merion dies here, he dies happy. You'd deny him that?" Merion's Backpack can be found between the two large mushrooms, lying next to several other, smaller mushrooms. You'll also find Merion's Journal, which shows his gradual descent into bliss: starting from a determination to use the mushrooms in creating a potion to protect him from magical illusions, to proclaiming his intent to marry the Malevolent Spirit. Open Merion's Backpack to find the Spore Potion Recipe that you'll need to break Merion's bewitchment. Lavendercap Mushrooms can be found on the lower, southern path that connects to the upper, eastern path. They're closer to the bottom level, in a group of three. Your first ingredient will bring about the Malevolent Spririt's voice: "Merion's soul is mine!" Gleamcap Spores can be found on the lower, western path that connects to the upper, southern path. They're closer to the upper level, and also in a group of three. Acquiring a second ingredient will, once again, cause the Malevolent Spirit to speak: "I'm all he can think about. Delicious." Bloodcrown Spores are found on the upper level, in the northwestern area. They are found in a group of four large, red mushrooms. Activate the final ingredient, and the Malevolent Spirit will mock you once more: "Merion's love is like a fine wine: so heady." Once you have all three ingredients, you will automatically create the Spore Potion. You are to now head back to Merion and free him from the clutches of the Malevolent Spirit. As you approach the duo for the final time, Sanesselamo will plea: "Don't ruin such an innocent love." Ignore his request, and activate the Malevolent Spirit to exorcise it with the potion. As it disappears, it will cry in rage: "No! Merion is mine! All mine!" While Merion suddenly snaps out of his delirium in a confused state: "What-? What's happening?!" Speak with Marion one last time. After handing him his scroll, he'll also vanish back to Auridon. Trek back to the tower portal, and encounter Sanesselamo's projection before entering the portal once again. This time he'll disappear harmlessly after showing displeasure at you breaking Merion's 'happiness'. Back at the tower, the entrance to Merion's Bliss is now gone, and next to its spot has appeared the portal to Nuulehtel's Despair. Enter the portal to save the last member of the Queen's entourage. You'll find yourself in, yes, another cave. This time, every inch of the area is covered in solid ice. This experiment, much like the last two, has a theme of enemies - this time it is Wolves and Bears. The layout is that of a large tunnel that's roughly square-shaped, and runs in a complete circuit with small branch passages. Head onward, circling the large column in front of you, and you'll find Nuulehtel next to a lantern, hunched over in despair. Speak with him to learn of his woes, and acquire the goal of creating a fire to warm him up. The components needed for the fire are Straw, a Bottle of Oil, and some Flint and Tinder, all of which are found on each end of the map. "Nuulehtel announced my expulsion from the Queen's inner-circle." "He suffers. His mind sits on the razor's edge." "Knowing secrets is like slowly freezing to death - painful; numbing." "Nuulehtel, the Queen's herald. The most knowledgeable man in the old, merry court." "Amazing, isn't it? The Queen chose a herald who can barely stand speaking to others." From the area with Nuulehtel, head east, taking a left turn and continuing north down the tunnel. You'll find an alcove to your left, where a Bale of Straw can be found. Take the Straw from the Bale and continue north. The path will take another left turn, heading westward. Half-way along this tunnel, it will curve right and then left again. The point on the curve is where an Explorer's Bag containing a Bottle of Oil can be found. Continue west, until the path turns once more and heads south. Another alcove, this time to your right, can be found with a Dead Explorer that you can obtain Flint and Tinder from. There's also a Faded Note next to the skeleton, which explains how this person was apparently Sanessalmos adjutant and after the mage's wife passed away and he was treated with cruelty, Sanessalmo became a broken man. After grabbing the Flint and Tinder from the skeleton, head back to Nuulehtel's area. A Burnt Campfire can be found near the large ice column. Activate it to light a fire for Nuulehtel. Speak with him after he proclaims his elation at being warm once again. Hand him the last Teleportation Scroll and he'll escape the icy prison. On your way back to the portal, Sanessalmo will appear one last time, clearly aggravated by your success in all three experiments. Head back to the portal and you'll find that there are now two portals. You can either take the left portal, which drops you right in Sanasellmo's lair, or you can take the portal back to the tower and use the trap door on the north end of the room. Once you're in his lair, head deeper inward to find the mad mage standing upon a stone platform in the middle of some torch stands. He'll be hostile, so a fight will break out immediately after approaching him. After defeating the entourage's captor, you can use the final Teleport Scroll to quickly leave the tower and return to Eminelya's camp. Speak with Eminelya to learn that the formerly imprisoned entourage members have gone ahead to catch up with the Queen. Finish the dialogue to complete the quest, which will net you some gold and the unique Light Armor Legs: Kilt of the Fractured Mind. Occasionally, if you can sprint around one of the experiment worlds fast enough, Sanessalmo's dialogue will overlap with itself. ? Eminelya's directed me through a cave and into a hidden Vale. She believes the mage has taken her companions there. There's a woman here, dressed in finery. A member of the Queen's entourage? I should speak with her. A magical projection has appeared, taunting me. This must be the mad mage. I should speak to him. I entered a place of burning ash and lava. I need to find Minantille as soon as I can. Minantille is under attack by some kind of phantom of her mind. I should go to her aid. I dispatched the beast that attacked Minantille. I should speak with her again. The teleportation scroll has seen Minantille free of this madness. I should leave her realm of rage. I've entered a strange cavern full of mushrooms and monsters. I should try to find Merion as soon as I can. Talking to Merion was singularly unhelpful, but he seemed to say I could create a potion that would snap him out of his enthrallment. I should search Merion's Backpack's to see if I can find anything useful. It seems I need to find mushroom spores in order to make the potion needed to return Merion to sanity. I should search the cavern for those mushrooms and collect them. I should be able to dispel Malevolent Spirit using the Spore Potion. Time to make use of it. Merion seems to be more lucid. I should speak to him. I used the telport scroll to evacuate Merion. I should leave the area. I entered a strange world of ice and freezing rain. I should find Nuulehtel as soon as I can. Nuulehtel is delusional. He says he's freezing, but won't leave the cave because he's cold. I need to collect some fire-starting supplies from around the cave. If he was warmer, perhaps he'd listen to reason. I have the materials I need to start a fire. I should do so. Perhaps then I can talk to Nuulehtel. Nuulehtel seems to be warming up. I should talk to him to see if he's returned to sanity. I managed to evacuate Nuulehtel with the teleportation scroll. I need to leave Nuulehtel's Despair as soon as I can. I freed the members of Queen Ayrenn's entourage. All that's left now is to find and confront the mad Mage Sanessalmo. The mad mage of Glister Vale is dead. I should return to Eminelya with the final teleportation scroll and let her know the good knows. HINT: The teleportation scroll I was given can get me out of the Vale right away. I should use it to return. Finishes quest I returned to Eminelya's side. I should speak to her one last time. This page was last modified on 9 April 2019, at 05:09.